I Didn't Make It To My Goal Of 60 Articles. But I'm Still Not Giving Up. Me trying to make heads or tails of this crazy algorithm I’ve made. Yesterday was supposed to be the day. I was supposed to write my last of 60 daily articles, and then have a nice, long break to pursue other things, such as practicing for an upcoming audition and doing homework, not to mention playing some video games. I had 80% of the article typed up after the usual three hours of typing, and I decided to do one final check before I did the last stretch and pressed that “publish” button. I counted, counted again, and then counted a third time, and found that I had only written 55 articles, five under my goal. For a moment, I was crushed. But now I’m back up and I’m gonna show those five remaining articles WHO’S BOSS! Well, actually, it was 59 articles. But it counted as 55. I’ll publish the article once I hit 60 for real, but in short, my goal was to write and publish 60 consecutive articles for each day. But stuff happens. Over those 63 days, I missed a total of four days. Perhaps two were excusable, but at least two days were days where it was inconvenient and even uncomfortable for me to write my articles, but not impossible. But I couldn’t simply push my goal back by one day every time I went a day without publishing an article. If I did, I could write just one article a week, and as long as I eventually got to 60 articles, it would add up. That’s hardly daily. And thus, I had to push the date of the goal back by two days each time I missed a day, with one “cheat” day that I had previously accounted for. So on the first infraction, it would count on my tally as an article written even though I didn’t write anything, but for any article missed after that, the goal was pushed back by two days. This way, if I missed enough days, I could still get back to day zero, penalizing missed days. Still with me? I know I had to think about this for hours to understand it myself, but then again, I’m not very good at math. Okay, so let’s go back to those four missed days, ignoring the fifth that was excused. 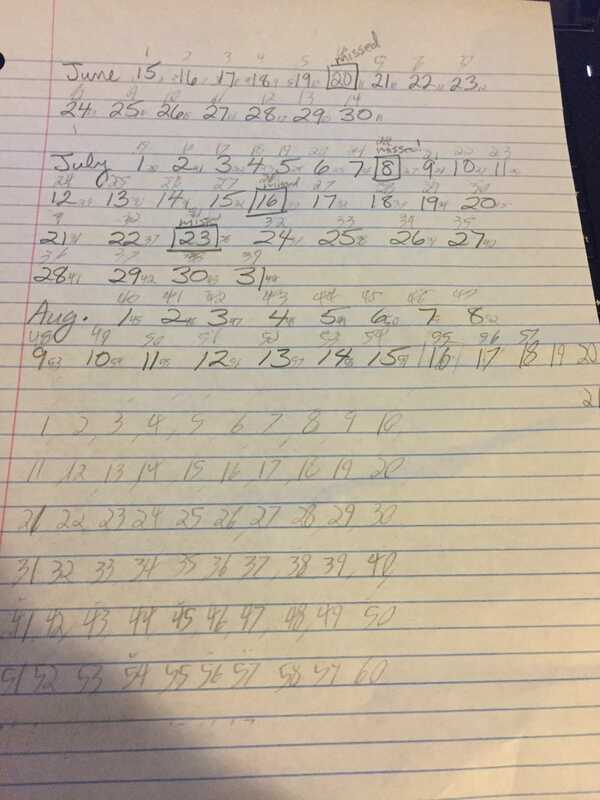 If each missed day pushes my final day back by two days, then the total amount of days pushed back is eight, meaning that a full run with four missed days will consist of 63 articles (because of the one that was excused) over the course of 68 days. Sure would’ve been easier if I just hadn’t missed a day, huh? So how did I make that mathematical boo-boo? Well, after my streak hit the 30s or so and I realized that I had a shot of actually making it to 60, I counted each article I’d written and added one to that number because of the one “cheat” day. After taking the two days I had already missed into account, I found the day, August 17th, and just put it in the back of my mind. Later, I would miss two more days, but the goal was not set back. This was not intentional. I simply forgot. But then, we have yesterday. Yes, I wrote for three hours, but I couldn’t publish the article I wrote because it was celebrating my victory over writing two months of articles, which I obviously couldn’t publish if I hadn’t actually won quite yet. So that pushes my goal even further away, right? Well... hopefully not. You see, there was a clause that saved my bacon more than once. If, the day after I miss an article, I write two articles, things carry on as if I had never missed a day. Usually, I never actually wrote two articles in a day. I would have published my first article at two in the morning and the second at the second at ten in the evening. Or I’d write the article the day before but mess up publishing due to technical difficulties and publish it the day after. Technically in the same day, but not really. Today is different. My plan is to finish writing and publish the article that you’re reading right now, that I’ve been working on for about two hours thus far, and then, after some yummy mac ‘n cheese and a cold shower, I’ll get to work on the second one. That will excuse yesterday’s lack of an article without setting my goal back. Think of it like a final boss: It’s an extra challenge right before the end. Then, there are three articles left. One for Saturday and Sunday, which should be fine, considering how it’s the weekend. And then the final article of my streak of 60 will be published on monday, although 80% of it had already been written on Thursday. If I were to do this streak again, I would do many things differently. First off, I’d make sure to publish an article everyday! But if I had my hands cut off and needed 24 hours to regrow them using sheer willpower, I would absolutely make time to write two articles in one day. A lot of the time, I would make excuses such as “This is a ‘me’ day” or “I just can’t do it today.” Bull poop. I’ve had days where I’ve sat at my desk for an hour without any words coming out, but sooner or later, I’ll be able to write something. It might be really short and really bad, but this is an exercise. Of course I want to entertain you fine people, but I can’t get better at doing that if I don’t show some cold discipline with my work. If it seems like I’ve been harsh on myself in this article, know that my final article (of the streak, certainly not ever!) will basically be me patting myself on the back, so don’t feel too bad! This article is all about my failures. The final one will be all about my success. One thing should be made very clear, as much as a reminder to myself as well as to everyone reading (which I imagine isn’t very many considering how much math was before this! ): This is fun. I absolutely adore writing about video games, and I wouldn’t give it up for the world. Yes, it can be stressful to balance writing and the million and a half other things that I have to do, and there are certainly days when I don’t want to write but force myself to anyway, but it’s all to make myself better at it. And there’s one other reason too, but I’ll keep you guessing as to what that is until Monday, August 21st, 2017. Tee hee.